Daniel Williams adds cocoa beans to the mill at Mozna Chocolate in Hidalgo. The process takes from two to five days to complete. Founding Mozna Chocolate in 2015 was an impulsive decision, according to McAllen immigration attorney and factory owner Anthony Matulewicz. He pitched the idea as he was driving with a friend, who asked how much it would cost, and then if Matulewicz would consider a partnership. “I give him number. He slams the brakes, gets out his checkbook and gives me a check for half of it,” he recalled. They restored a building on Brazil Avenue in Hidalgo, which Matulewicz said is formerly a drug house. Matulewicz calls the business model an extension of his “semi-political (and) semi-personal” views. “We’re trying to help the communities down there,” said Matulewicz of his cacao suppliers in Venezuela, Tanzania, Vietnam and Mexico. Large candy conglomerates, like Nestlé or Hershey’s, pays roughly $2,900 per ton of cocoa beans, he said. Artisan chocolate makers pay up to $11,000. 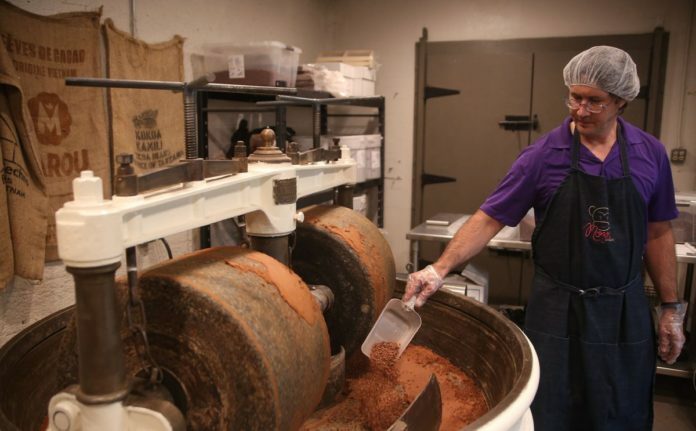 After committing to making chocolate, Matulewicz realized he knew nothing about it. He set off on a year-long journey through Latin America and Europe in hopes of learning the process from those he considers the best makers in the world. He knocked on doors and to his surprise, chocolate makers were receptive. Matulewicz recalls asking an Italian why he was willing to help him. With large-scale producers, conching — a grinding process that heats cacao, grinding the acidity out of beans — is done with modern technology. Corporations can complete the process in six hours because they add external heat sources. “We do it on a mill that’s over 100 years old,” he said, adding that it takes from two to five days. Chilean granite wheels crush beans, creating friction that slowly melts the chocolate. With mass producers, tastes remain consistent over time because of the elements of control, and the fact that they’re not using single-origin cacao beans. “With me, I’m not going to be able to give you the same flavor from this year to next year because it’s not going to be the same bean,” he said. The factory hosts tours to teach customers about their process. Matulewicz sees education as key to expanding people’s interest in craft products. He said he’s encouraged by trends showing small-batch makers’ imprints expanding. “We want to bring a lot of what used to be the old culture back here” which is lost through modernization, he said. Working in the world of chocolate provides Matulewicz a new community of colleagues and clientele. “Nobody likes to deal with attorneys — I mean nobody. It’s just a fact of life,” Matulewicz said. “Usually, if you go to an attorney, it’s because you have a problem or you’re anticipating a problem. Chocolate is different, he said. For more information, visit moznachocolate.com.